"DON’T BLAME THE DOGS…BLAME PEOPLE"
A few days ago 29-year-old Alex Jackson was arrested and charged with murder in the death of Pamela Devitt, 63, the Lancaster, CA woman who was fatally mauled by a pack of Jackson’s dogs with a history of previous attacks. Despite his wife death, Devitt’s husband, didn’t blame the dogs involved, or demonize the breed. Her husband told KCAL-TV he blamed the dogs’ owner for what happened. “I do not blame the dogs. I don’t blame pit bulls,” Ben Devitt said. “I blame people who don’t take responsibility for their animals.” For more details, check out the Huffington Post report. When I wrote about our last book signing at Bank of Books a few weeks back, I forgot to thank some of the friends who stopped by to show an share some love. Since it’s better late than never, a big ‘Thanks’ to – David & Terry, Annette & Jasmine, Carl, Robert, Zari, Margaret & Ryan, Karen, Gary & Eleanor, Jake and Melissa. Eugenie, Tanner I I really appreciate your support. 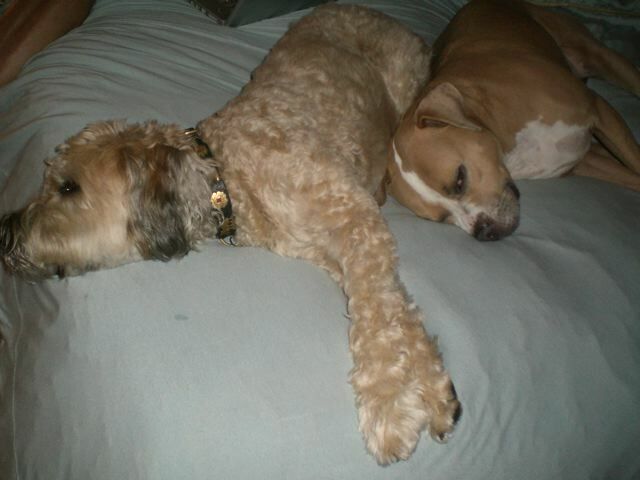 Dexter & Tanner: Pitbulls are inherently dangerous. Really? If you are looking to keep your dog healthy, happy and under control, consider dispensing with that retractable lead and using something that offers more control and safety. In an article in Dog Whisperer Cesar Millan’s online newsletter, Jon Bastian writes: “There are three big issues with retractable leads, the first of which is safety. Since they can effectively allow your dog to run for twenty or more feet before the end of the line, they allow your dog to build up a lot of speed. Remember “force equals mass times acceleration” from high school physics? Well, give even a small dog a twenty foot head start, and they can build up enough speed to pull you off your feet, break the lead, or yank the handle right out of your hand. That last situation can be particularly disastrous, since the handle will then retract on the lead, and the sound and motion of that big hunk of plastic suddenly whizzing up from behind can make your dog think something is chasing it, inspiring it to run faster and farther. There’s also that twenty feet of line between you and your dog, which can be nearly invisible under the right circumstances. Your dog can get tangled in it, or tangle you or another person in it. Even the website for a prominent manufacturer of retractable leads warns of multiple possible injuries, including cuts or burns from the line, falls, eye and facial injuries, and even broken bones or loss of fingers. You wouldn’t let your dog run free in the middle of the street, but very long leads can allow exactly this to happen. Dogs on retractable leads can and have run into traffic and been killed by cars. Beyond safety issues, retractable leads just teach your dog the wrong thing: That pulling on the lead will get them what they want — in this case, the freedom to run all over the place. When they stop pulling, the lead pulls back, so the desire to pull and run away is constantly reinforced. Finally, retractable leads may be illegal in your area. For example, the leash law in the city of Los Angeles reads, “Every person owning or having charge, care, custody or control of any dog shall keep such dog exclusively upon his own premises provided, however, that such dog may be off such premises if it be under the control of a competent person and restrained by a substantial chain or leash not exceeding six feet in length [emphasis added].” The same is true for leash laws in Los Angeles County, and may be similar in your jurisdiction. Aside from endangering a dog’s safety, many users of retractable leads may not even know that they’re breaking the law.